The opinions expressed in this article are the author’s own and do not necessarily represent those of Civics Nation. Conceived in the aftermath of the revolution, the Second Amendment is a two-and-a-half-centuries old relic from a time when an armed citizenry could expel the most powerful nation on the planet with muskets and cannons. What specific right does this amendment guarantee? The NRA wants you to believe that no other rights can exist without the Second Amendment; without the constant threat of armed insurrection against the government, our other rights are forfeit. Civics Lesson: A History of Voting Rights in the U.S. The United States wasn’t always a place where everyone could vote. In fact, in the early years of the U.S., voting dates and laws were left to the individual states. Article I, section 4 of the Constitution reads, “The times, places and manner of holding elections for Senators and Representatives, shall be prescribed in each state by the legislature thereof; but the Congress may at any time by law make or alter such regulations.” Unfortunately, this led to unfair voting practices, and white men with property were the only Americans regularly permitted to vote. By 1860, white men without property were allowed to vote. African American voting rights began with the passage of the 13th Amendment, abolishing slavery and the 14th Amendment, allowing former slaves to become citizens. The 15th Amendment mandated that all Americans regardless or “race, color, or previous condition of servitude” be allowed to vote. Although this amendment guaranteed African Americans the right to vote, this didn’t happen in practice, as many Southern states imposed poll taxes and literacy tests, along with intimidation and outright violence, to keep black people from voting. Native Americanswere not even considered citizens of the U.S. until 1924, when the Snyder Act granted Native Americans citizenship. Although the 15th Amendment guaranteed people of all races the right to vote, Native Americans weren’t able to do so until the government granted them citizenship. Even so, they were often prevented from voting by individual states; it took more than 40 years for all states to comply with the act. The 24th Amendment of 1964 prevented the use of poll taxes, which was one of the ways African Americans and poor white people were disenfranchised. 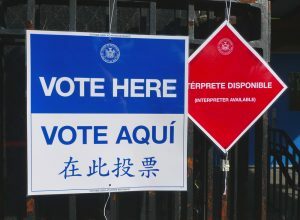 The Voting Rights Act of 1965 prohibited states from using literacy tests and other methods of excluding African Americans from voting. 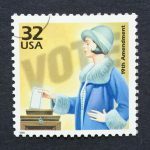 From the founding of the U.S., the legal minimum voting age was 21. But in the late 1960s, the generation that fought the Vietnam War also led the march to a younger voting age; if a person was old enough to be drafted, they said, they should be able to vote. The measure was quickly approved by the House and Senate, and the individual states ratified the measure in only three months. In 1971, President Richard Nixon signed the 26th Amendment, lowering the minimum voting age to 18. It wasn’t until 1986 that people living or serving in the military outside the U.S. got the right to vote. The Uniformed and Overseas Citizens Absentee Voting Act was written and signed into law by President Ronald Reagan. It allowed citizens to vote in federal, state, and local elections by absentee ballot. To this day, felons do not have the right to vote. More than 4 million Americans have lost their right to vote due to felony convictions, even if they are no longer in prison. What threat does a citizenry armed with assault weapons pose to a government with enough nuclear firepower to destroy all life on the planet? If the Second Amendment guarantees citizens the right to arm themselves against their government, does it require civilian weaponry to scale with the Department of Defense’s technology? Should we have an inalienable and unfettered right to operate Apache helicopters? To fly Predator drones with Hellfire missiles? A healthy democracy has no need for an heavily armed citizenry. The only defense against a tyrannical government in the atomic age is a strong democracy. 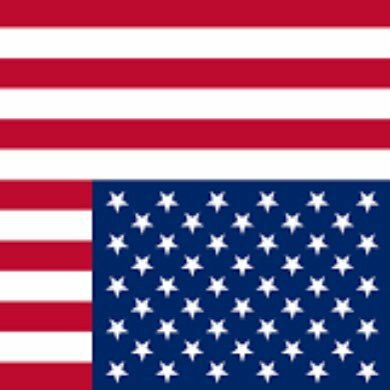 The more our federal government represents the views and intentions of the people, not special interests or fringe lobbying groups, the more improbable a tyrannical state becomes. Unfortunately for us, our democracy is not well. No debate better exemplifies this than the one on gun control in America. Seventy five to eighty percent of NRA members support background checks on all gun purchases. The vast majority of Americans agree that we need to better regulate the right to own a weapon in this country. But the gun lobby and their manufacturers have bought the political power to silence the majority of Americans. And the toxic and conspiracy-fueled right wing media echo chamber prevents the entire country from living in a shared reality in which we could begin to address the problems facing our country. Election Day must be a federal holiday. Every election we hear stories of unjustifiably long waits at polling stations. This is by design. Republicans in Ohio, for example, have specifically restricted voting hours in democratic counties while expanding it in republican counties. There is no legitimate argument for restricting the franchise of citizens—and even less so for partisan targeting of voting hours. We need national vote by mail. Oregon and Washington send out paper ballots to all voters two weeks before Election Day. While the statistics on increased turnout in these states is dubious, any effort that makes voting more accessible and more sensible to citizens that often have several jobs and no time to stand for hours in line at a polling station must be considered. It is also not possible to hack a paper ballot. The voting age should be lowered to 16. The students at Marjory Stoneman Douglas High School in Parkland, Florida have shown more maturity, compassion, and responsibility through their advocacy than our political leaders. They should be allowed to cast ballots and their registration should occur at 16 when they get their first driver’s license. Contrary to what the NRA claims, the Second Amendment is not the prerequisite for all our other rights, especially when the NRA is selective in its defense of gun owners—as in the case of Philando Castile. The NRA’s argument of preventing tyranny is completely divorced from reality. What good is your stockpile of assault weapons in the face of the U.S. military? If the Second Amendment was created to give citizens the weaponry to defeat an oppressive government, then why doesn’t the NRA demand Predator drones for all Americans? Why don’t they demand nuclear weapons as a right of all law-abiding Americans? A healthy democracy has no need for high-powered guns. We need to be realistic about the power of nation-states in the 21st century. Our only option is to prevent the conditions that create tyrannical governments by expanding the right to vote and access to the ballot box and by making it easier for Americans to have their voices heard in our democratic republic. You can find Andrew on Twitter @atheis14.